This card would be filled out to accept the invitation to the Duke Centennial Celebration and designate a delegate to attend. The invitation describes the history of Duke University and invites Berry College to send a delegate to the centennial celebration. The author tells Martha Berry that there is a lot of enthusiasm for the second Alumnae Week at Duke and asks that she come to Duke from March 31 to April 2. 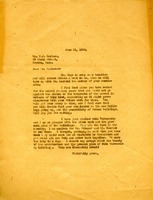 Mildred writes to Martha saying she is sorry for not getting her letter sooner. She also mentions that she enjoyed what she saw of the campus during her visit, she also hopes to be able to contribute some books to the library at Berry from time to time. 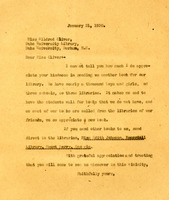 This letter includes the donation of a book to one of the libraries at Berry and details Martha Berry's appreciation of Miss Oliver's generosity. Miss Berry writes that Mr. Hoge is on vacation and will figure out Mr. Carlson's commission when he returns. She says that she feels sure that Mr. Carlson will decide that the history of his work with the schools and the possiblity of future work will pay him for waiting for his comission. She also mentions the beauty of the buildings at Duke University and desires Mr. Carlson to visit them.